This issue does not result in observable errors. Enable the trace for any of your APIs that is currently being used by your users and check if you are able to get any requests in the trace. Note: NOTE: This technique will be useful only if you want to check if there is traffic at this point in time rather than in the past. 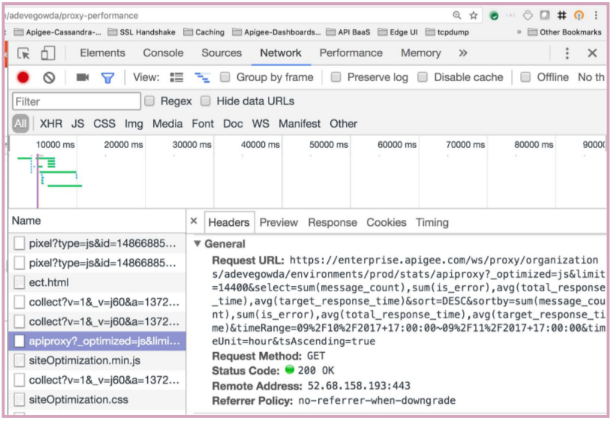 View the Nginx access logs (/opt/apigee/var/log/edge-router/nginx/logs/access.log) and see if there any new entries for API Proxies for the specific duration. If you log information from API Proxies to a log server such as Syslog, Splunk, Loggly, etc., then you can check if there are any entries in these log servers for API Proxies for the specific duration. If there's no traffic (no API requests) for the specific duration, then analytics data is not available. You will see "No traffic in the selected date range" in the analytics dashboard. Make some calls to one or more API proxies in the specific organization-environment. Wait for a few seconds, and then view the analytics dashboards in the Hour tab and see if the data appears. If the issue persists, then proceed to Data available in Postgres Database, but not displaying in UI. First, determine the availability of latest Analytics data in Postgres database. NOTE: Replace orgname and envname with your organization and environment names. If the latest timestamp is very old (or null), then this indicates that data is not available in the Postgres database. The likely cause for this issue would be that the data is not pushed from the Qpid Server to the Postgres database. Proceed to Analytics Data not being pushed to Postgres Database. If the latest data is available in the Postgres database on the Master node, then follow the below steps to diagnose why the data is not displaying in the Edge UI. Select the Network tab from the Developer Tools. On the left hand panel in the Developer Tools, select the row having "apiproxy?_optimized...". On the right hand panel in the Developer Tools, select the "Headers" tab and note the "Request URL". If you see a successful response but without any data, then it indicates that the Management Server is unable to fetch the data from the Postgres server due to network connectivity issues. If you are unable to connect to the Postgres server, check if there are any firewall restrictions on port 5432. If there are firewall restrictions, then that could be the cause for the Management Server being unable to pull the data from the Postgres server. If there are firewall restrictions, then remove them so that the Management Server can communicate with the Postgres server. If there are no firewall restrictions, then this issue could be due to network glitch. If there was any network glitch on the Management Server, then restarting it might fix the issue. Check if you are able to see the analytics data in the Edge UI. If you still don't see the data, contact Apigee Support. If any Qpid Server is down, then restart it. If not, jump to step #5. Wait for some time and then re-check if the latest data is available in Postgres database. If the latest data is available, then skip the following steps and proceed to last step in Resolution section. If the latest data is not available, then proceed with the following steps. Check if the messages from Qpid server queues are being pushed to Postgres database. Execute the qpid-stat -q command and check the msgIn and msgOut column values. Here's a sample output that shows the msgIn and msgOut are not equal. This indicates that messages are not being pushed from Qpid Server to Postgres Database. If there's a mismatch in msgIn and msgOut columns, then check the Qpid Server logs /opt/apigee/var/log/edge-qpid-server/system.log and see if there are any errors. This could happen if the Postgres Server is running too many SQL queries or the CPU running high and hence unable to respond to Qpid Server. This restart ensures that all the previous SQL queries are stopped and should allow new connections to the Postgres database. Reload the Analytics dashboards and check if the Analytics data is being displayed. Check the status of the Qpid and Postgres servers from the results of the API call. If the status of Qpid and Postgres servers are shown as "SUCCESS", then it indicates the analytics servers are wired properly. Proceed to Stale Analytics Server UUIDs. 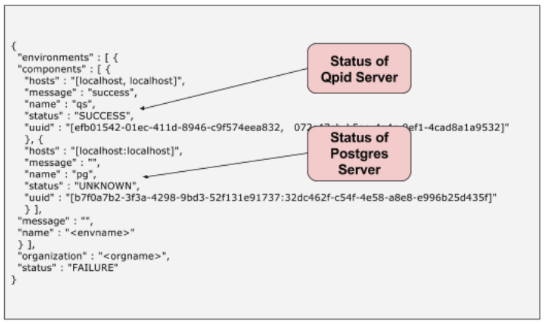 If the status of Qpid/Postgres servers is shown as "UNKNOWN" or "FAILURE", then it indicates an issue with the corresponding server. This may happen if there is a failure during the onboarding of analytics. This failure prevents the messages from Management Servers reaching the Postgres servers. This issue can be typically resolved by restarting the servers which showed the "FAILURE" or "UNKNOWN". org-env names listed in the "scopes" element. UUIDs of the Postgres servers and Qpid servers. If all the information is correct, then proceed to Analytics Data not being pushed to Postgres Database. If the UUIDs of Postgres and/or Qpid servers are incorrect, then it could be possible that the Management Servers are referring to stale UUIDs. To remove the stale UUIDs and add the correct UUIDs of the servers, contact Apigee Support.